Say goodbye to waking up with headgear hair and red marks on the forehead and cheeks thanks to the Bleep CPAP Mask Solution! 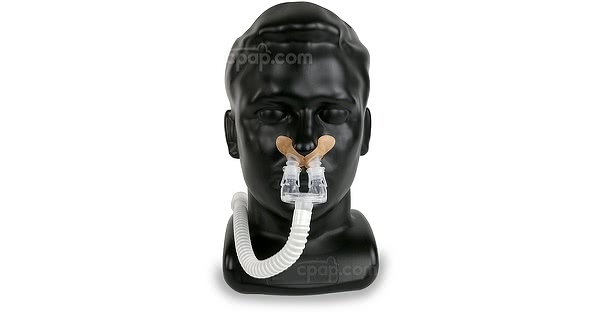 The Bleep Mask uses no headgear and connects to the nose using gentle adhesive seals to keep the mask in place and provide an ultra-reliable seal. 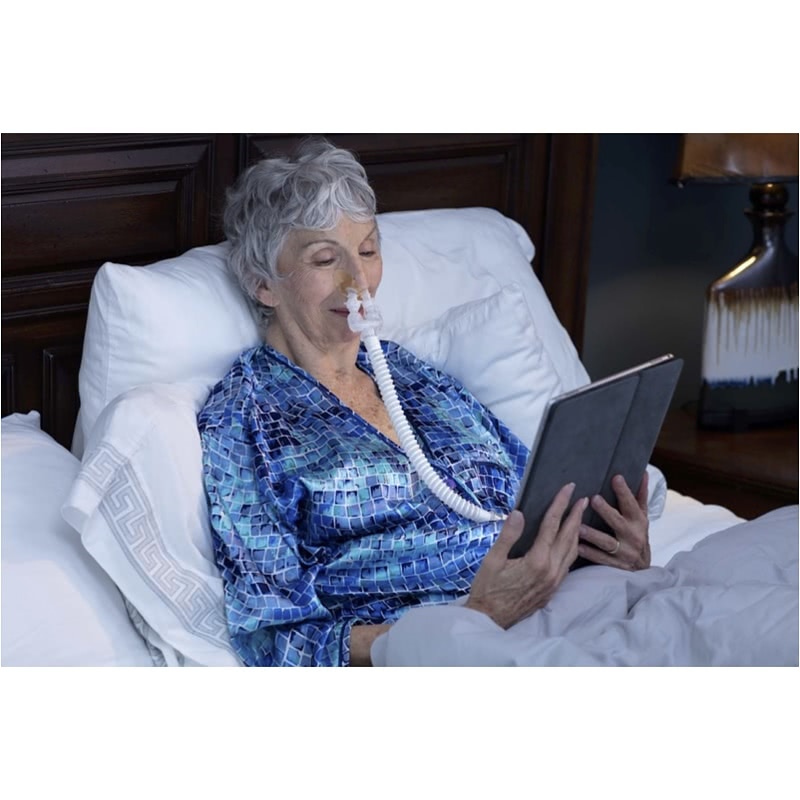 The Bleep Mask is also flexible enough to move with you throughout the night thanks to its innovative short tube design and can accommodate almost any sleeping position. It's one of the least intrusive masks on the market today, and it's great for anyone who may be an active sleeper or experiences issues with claustrophobia. Tired of having a bulky mask limiting what you can see or do before falling asleep? With the Bleep DreamPort Sleep Solution Mask, you can easily use electronics, watch TV, or read a book. You may feel less closed in and claustrophobic than with other masks. The Bleep is unlike any other mask on the market today. It uses gentle adhesive covers to create an airtight seal around the base of each nostril and then pairs with a short tube, making a strapless connection to your standard-sized hose. It doesn't penetrate the nostrils or insert itself into the nose in any way. It creates a seal on the outside, helping reduce leaks and completely eliminating the need for headgear. 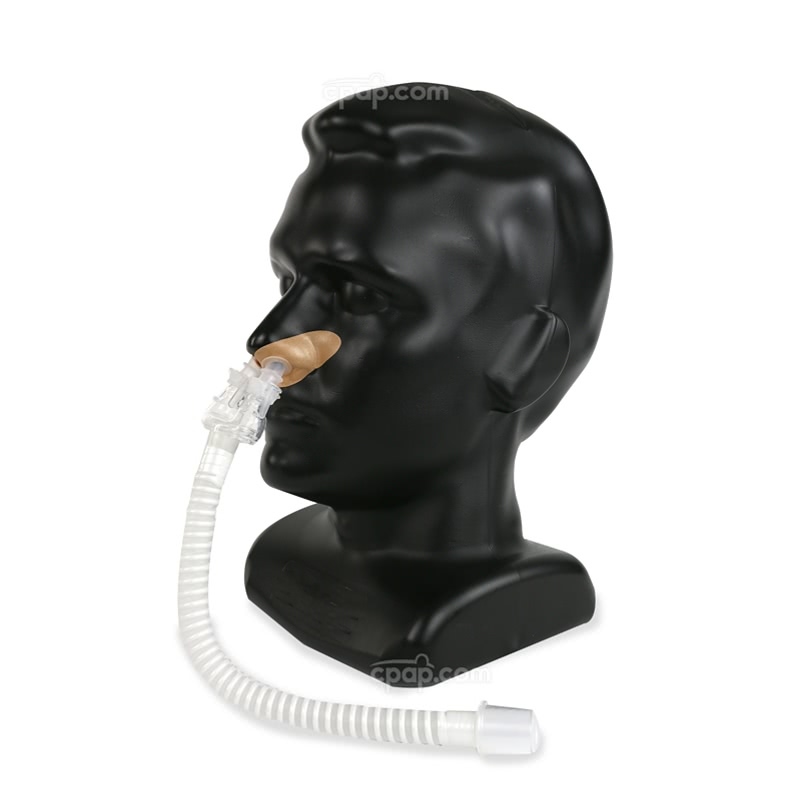 Many have dubbed the Bleep to be one of the first true "no-mask CPAPs", because of this unique design. 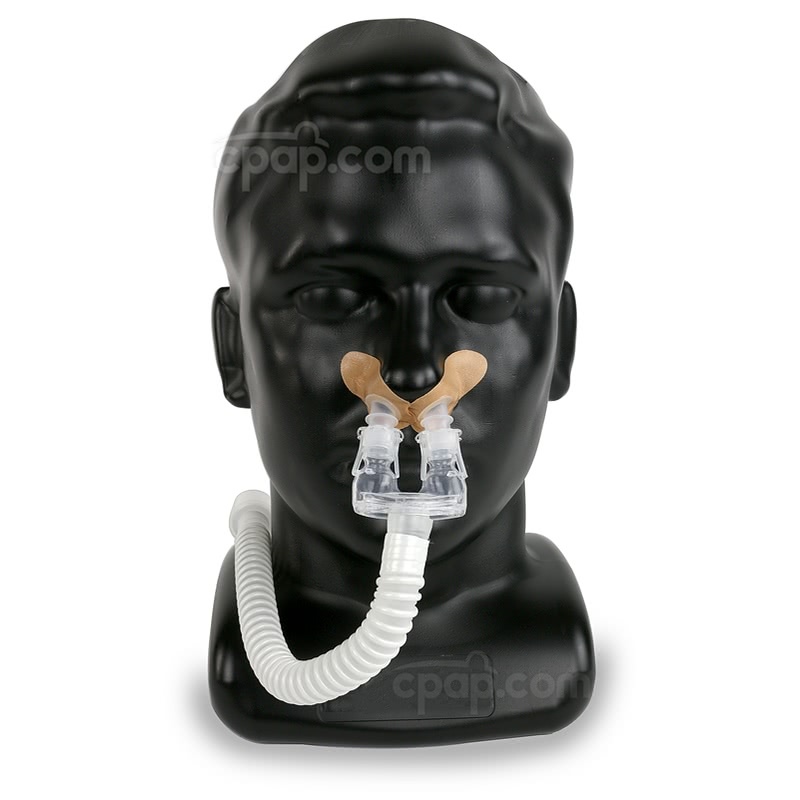 The Bleep DreamPort Mask's revolutionary design enables CPAP therapy without the annoyances commonly found with most headgear. You won't have to deal with unsightly red marks on your cheeks and forehead, and it won't mess up your hair while you sleep. You'll enjoy the benefits of CPAP therapy while not feeling the same firm pressure on your head while you sleep. The nostril covers used in the design of the mask are referred to as DreamPorts, and they're easy to put on and take off. For the best seal, it's important to make sure your nose is clean; with all oils, dirt, and makeup removed. You'd apply them just like you would a sticker to the base of the nostril and to the side of the nose. Once attached, the Bleep Mask clips into place. For most people who experience feelings of claustrophobia while sleeping, the discomfort comes from feeling closed off or boxed in. The Bleep DreamPort Mask uses no headgear and creates a very wide open field of vision, meaning you'd be less likely to feel the discomforting feelings you'd normally associate with claustrophobia. This mask uses a short tube design that moves with you while you sleep. This is a huge benefit for active sleepers, who move frequently during the night and require added flexibility. The adhesive included with the nostril covering DreamPorts is designed to hold firmly and be gentle at the same time, keeping the mask in place while you move about. The Bleep DreamPort Mask system won't cause any allergy flare-ups and is completely latex-free. The hypoallergenic design is great for anyone who has problems with allergies and will keep your therapy running and won't bother your nose. The adhesive for the DreamPort Nostril Covers are intended to be single use only, and can't be reapplied for a second night's use. Remove the DreamPort Nostril Covers from the pad. You will need 2 each night. Tilt your head back so you can see your nostrils clearly. Carefully line up and center the DreamPort so it can function as an extension of your nostrils. Avoid placing over the cartilage of the nose, as this can disrupt airflow. Follow the same steps when applying the DreamPort to your other nostril. If you're not able to breathe well, you may need to adjust the DreamPorts so they line up correctly. The airflow may be partially covered by tape. Adjust the DreamPort as needed until you're able to breathe easily. For these steps, the manufacturer recommends standing in front of a mirror. It's best to connect one node at a time. Begin by pinching the quick release tip of the connector, located on the side of the mask connector. Guide the node into place so that it pairs with the tube found on the DreamPort. Let go of the clips. You should hear an audible click. Repeat the process for the other nostril. Once you connect both nodes to its tube counterpart, your mask is ready for use. The only thing left is connecting the short tube to your standard size hose. Please be advised, this product is NOT compatible with the AirMini. To connect the short tube to the hose, you will need to guide the open end of the hose to the open end of the short tube and slide the short tube into place. The manufacturer intends for customers to use a standard hose or a standard-sized heated hose. It won't fit the special tubing found with the AirMini. If you notice a leak from your mask, it means the tape is not properly sealed, and could be the result of human oils on the skin. It could also mean the mask is not properly connected to the DreamPorts. You may need to try to press down on the adhesive bonding the tape to the skin. If that doesn't work, you may need to clean the area and reapply the DreamPort. Make sure the temperature of the room is comfortable enough, so you won't perspire or sweat. Sweat and perspiration can cause the seal to break. If you have any kind of allergic reaction, discontinue use immediately, and consult your physician or medical professional responsible for your care. Please discontinue use if any of the following occur: tooth, gum or jaw soreness, severe headache, chest discomfort, shortness of breath or eye pain. Is the Bleep DreamPort Sleep Solution Mask quiet? It is, but only if it is properly attached. Remember the seal is only going to be as good as the adhesive, and if you've put it on incorrectly or your skin is too oily, you may not get the best seal. For best results, you'll need to make sure you've removed all human oils from the application area, and make sure you've lined it up with your nostrils. Is it lightweight? Is it small? The Bleep is one of the smallest masks available on the market today, and it has a very minimal footprint. 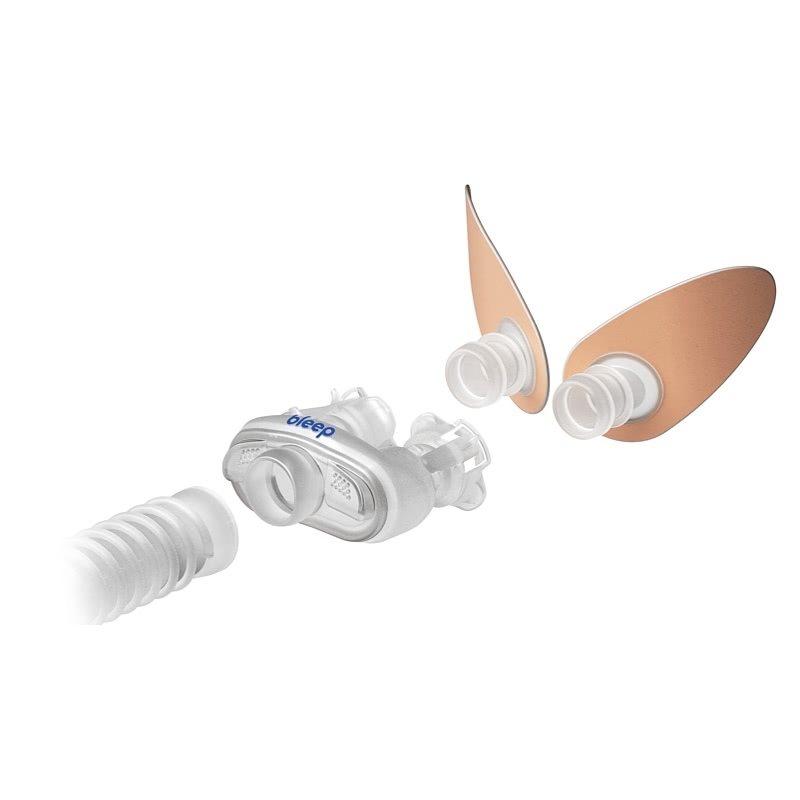 For people looking for a true "maskless CPAP", the Bleep is one of the few out there truly falling into the category. It's sort of like a cross between a nasal mask and a nasal pillow mask, but it functions differently from these two common types. Instead of trying to call it a nasal or a nasal pillow mask, it's really in its own category. Will it hold up against my skin? Can I use lotion? The Bleep will work with most skin types, but the adhesive is sensitive to oils. If you have particularly oily skin, the Bleep may not work as well. Also, make sure all makeup has been removed completely before applying the DreamPorts. Any residue left behind can result in leaks. It's best to avoid using lotion in the area where the DreamPorts will be applied, as some lotion can leave behind an oily residue. What's the process look like for replacement? The DreamPorts are only good for a single use and come in boxes of 32. Every night, you will use 2 DreamPorts. One box of DreamPorts will last 16 days. You will need 2 boxes of DreamPorts per month. 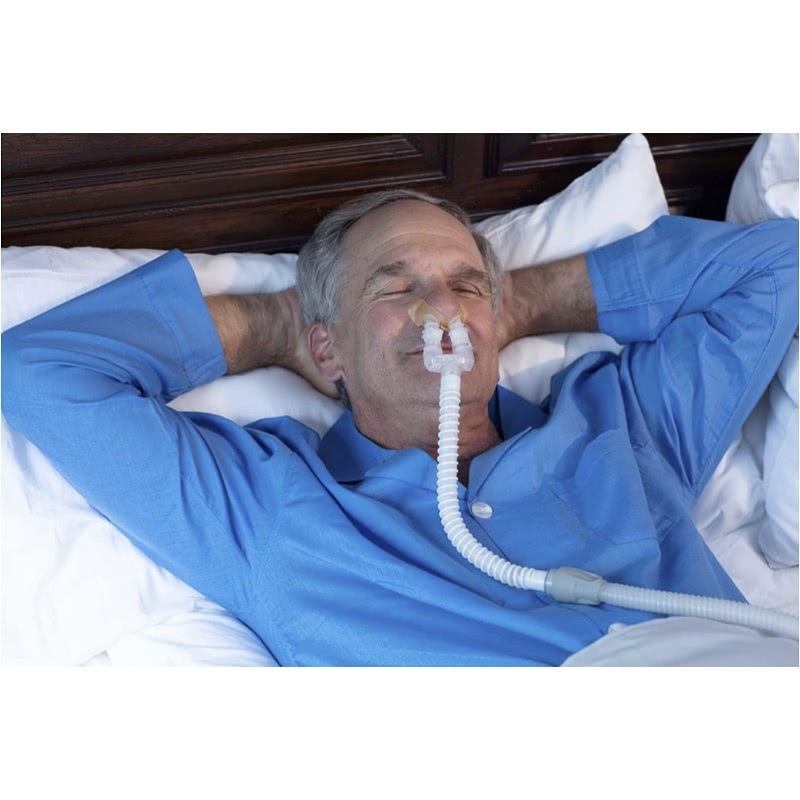 You can order more DreamPorts from CPAP.com. Who is this product a good fit for?